Summary: The ancient land of Éirinn is mired in war. Ciara, Princess of Mide, has never known a time when Éirinn’s kingdoms were not battling for power, or Northmen were not plundering their shores. 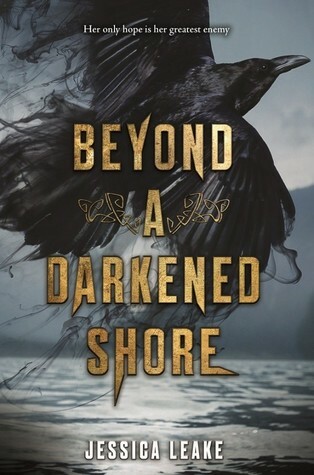 Beyond a Darkened Shore completely took me by surprise, I wasn't expecting to like a story about giants as much as I did. Eirinn is a land made up of kingdoms who are constantly having to protect their home from pillaging Northmen. Ciara, the mc, lives in Mide and because of her supernatural abilities she has been able to keep her people safe. That all changes, however, when she starts seeing a ominous crow who shows her dark visions. Then when Northmen arrive on Mide's shore, she discovers that their leader, Leif, could be the key to helping her save Eirinn from the evil that threatens to destroy those she loves dearly. I liked both Ciara and Leif, they were interesting and well rounded characters who I found myself easily rooting for. I could relate to the strong bond they had with their siblings, and their sense of loyalty was admirable. Although from different backgrounds the slow build up of trust, friendship, and then something more was well executed. Plus, the romance featured one of my favourite tropes: enemies to lovers! Warning for those not into gory violence, personally I'm not a fan, but I enjoyed the characters and their story so much I didn't really care. Overall, it was a great stand-alone! Yay :D I'm glad you mostly enjoyed this book a whole bunch. <3 It was a four star for me; I really loved the characters too :) Lovely review Renu.